Figures gathered by the CDC (Centres for Disease and Control Prevention) reveal 33.5% of American citizen have high cholesterol levels. Only one in three of people with high cholesterol levels have the situation under control. The situation is equally worrying in Europe. Statistics gathered in 2008 by WHO (World Health Organisation) reveal the extent of the problem on a worldwide scale. 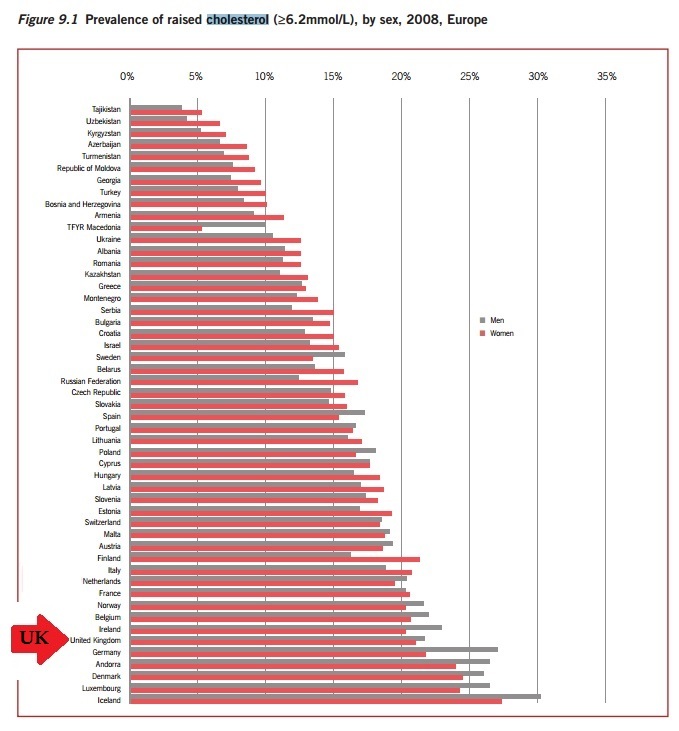 In 2008 the global prevalence of raised total cholesterol among adults was 39%. The data also shows Cholesterol levels in the UK are some of the worst in Europe. 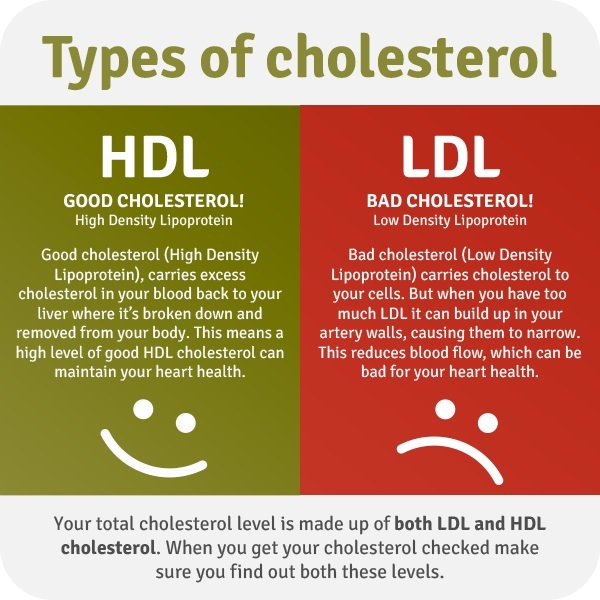 High cholesterol levels can cause heart attacks and strokes and one of the most worrying things about it is most people who suffer from high cholesterol remain blissfully unaware because there are no warning symptoms indicate high cholesterol levels. So, unless a cholesterol test has been carried out, most people are unaware a problem exists until it is too late. Cholesterol is a lipid substance manufactured by the liver. It is important for many of the body's biological functions, including cellular repair and the manufacture of vitamin D. The body is very efficient, and produces all the cholesterol it needs (around 1,000mg per day for the average person), but eating cholesterol rich foods such as eggs, red meats, and full fat dairy products can soon upset the balance. In fact many popular foods have the ability to send cholesterol levels through the roof, but just to complicate matters a little further there are, in fact, two different types of cholesterol and only one type is considered bad. Unhealthy eating choices are probably one of the main causes of high cholesterol, but they are not, by any means, the only contributing factor. Many of the contributing factors, such as high blood pressure and obesity, can also often be controlled by improving dietary practices; so making healthier food choices is very good way to start lowering cholesterol levels naturally. If necessary, cholesterol levels can be brought under control more quickly by the use of a prescribed medications, such as statins, or quality food supplements. According to statistics, most people consume between 150 - 250 mg of cholesterol per day. There are also people whose unhealthy dietary choices provide them with much more and in many cases this because they have no idea which foods are the worst offenders. One of the best ways to lower cholesterol is to cut down on high cholesterol foods, but certain foods also have the ability to help bring cholesterol levels down and, as mentioned previously, cholesterol lowering drugs and supplements are available. Although cholesterol lowering food supplements like Lowerol can offer s the similar or better benefits than statins, we strongly urge statin users to discuss the matter with their doctor, or other medical professional, before using Lowerol alongside their present medication or as a statin alternative.